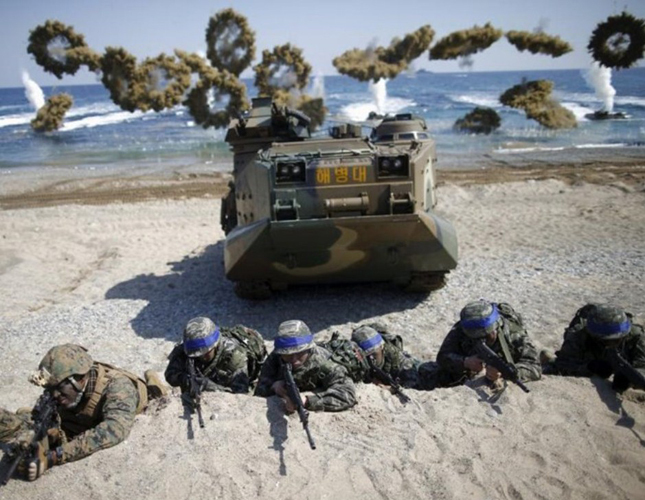 Marines from South Korea and the United States kicked off an amphibious landing operation along the eastern coast, a military official said Monday, the latest in a series of military drills meant to demonstrate the resolve of the allies to counter Pyongyang’s evolving threat. The weeklong exercise involves some 2,600 Marines from South Korea and 130 counterparts from the United States. The troops will be supported by some 10 warships, including Aegis destroyers, and 30 amphibious assault vehicles and aircraft, the South Korean Navy said in a statement, cited by state news agency (Yonhap). “The drill is mainly aimed at countering any maritime provocations by the North near the eastern sea border,” a Navy spokesman said. The latest maneuver is part of the broader Hoguk combined drill, which the Army, Navy, Marine Corps and Air Force has carried out since 1996. The two weeklong Hoguk combined exercise will run through November 11, according to South Korea’s Joint Chiefs of Staff (JCS). The focus of this year’s field training exercise is to further enhance interoperability of the different forces and imbue the troops with the “fight tonight” spirit against the North’s provocative acts, the JCS said. This readiness will allow the country’s armed forces to meet any threat coming out of North Korea. Pyongyang has conducted two nuclear tests and tested a series of ballistic missiles this year alone, escalating tensions on the Korean Peninsula and in the Asia-Pacific region.